Steamboat ski area views, unit size, and location in the Olympian building are some factors that effect pricing. A 3rd Floor 3 bed, 2 bath Olympian condo with private patio space and great light recently closed 4/29/2016 for $836,000 or $545/SF. Prices are up 26% over sales in 2013. The Olympian is located downtown on 5th st. across from the Yampa River bike/pedestrian (Core Trail). Walk to dinner and nightlife, Howelson Hill skiing and Emerald trails and all that historic downtown Steamboat has to offer. Olympian condos include parking space in the lower level garage plus storage space. All buyers are subject to a 0.5% transfer fee to the SSWSC upon transfer of title. Finding great views and plenty of space for a larger family near the ski slopes can be a challenge in Steamboat Springs if you are looking to spend less than $800,000. Currently there are only 3 townhomes listed for sale with over 3000 Sq.Ft in the mountain area, and if we add private homes to the search, there are 2 as of the date of this Steamboat real estate blog. Families are drawn to Steamboat Springs and here are just a few reason why as mentioned in Ski Magazine. West || No. 4: Steamboat, Colo.
One of the best deals out there for quality construction and nicely appointed features is Eagles Overlook # 104. Eagles Overlook #102 recently sold - a distress sale. In April of 2008 #105 sold for $985,000. #104 listed at $795,000 is one of the lowest prices per Sq.Ft. for a luxury townhouse in Steamboat Springs and HOA dues lower than the competition. What’s affordable for a condo in Steamboat with 2 or more bedrooms? The real estate market for older 2 bedroom condos has been pretty soft until just recently. Since November 1st 2012, we have seen 25 sales for condos in Steamboat with 2 or more bedrooms sell and as of the date of this Steamboat real estate blog, there only 8 on the market. The best deal at Walton Creek is now under contract, so the next best deal per price per square foot, nicer finishes, near the mountain and on the city bus route suitable for both nightly and long term rentals is located at Shadow Run for $174,900 at just $150/SF. Owning a One Steamboat Place condominium in Steamboat Springs, Colorado comes with the privilage to stay in some of the top rated hotels in the world. Travel + Leisure has rated Timber’s Resorts Castello di Casole in Tuscany, Italy 2nd best hotel in the world and number 1 in Europe. If that isn’t the icing on the cake, Timber’s Resorts has 11 more luxury properties to choose from in addition to One Steamboat Place and Castello di Casole - all are fetching rave reviews. One Steamboat Place owners enjoy five-star amenities including ski services, family game room, state-of-the art fitness center, yoga and Pilates studio, outdoor heated pool, hot tubs, weekly wine tastings and events, and the best private spa in Steamboat Springs. Their attentive concierge will make arrangements for your airport and around town transportation, pre-arrival grocery shopping, and any activities or adventures you desire. More than $60 million inventory has sold so far; prices start from $1,500,000 for a 3 bedroom, 3 bath luxury ski-in condominium. One Steamboat Place has a wonderful Guest Visit Program for families that are interested in experiencing our lifestyle before purchasing. Call me - Dean Laird, Colorado Group Realty at 970-846-8284 and I will get more details out to you quickly. Search here for the current listings at One Steamboat Place in Steamboat Springs Colorado. Steamboat Springs skiing, is just a step out the front door and a quick gondola ride that takes you to the base of the Steamboat Ski Area. Trailhead Lodge are elegantly decorated condominiums feature hardwood flooring, granite counters, large decks offering spectacular views of the Steamboat Ski Area and Yampa Valley. What’s Cooking at Trailhead Lodge Trailhead Lodge auction is coming up quickly December 15th, 2012. 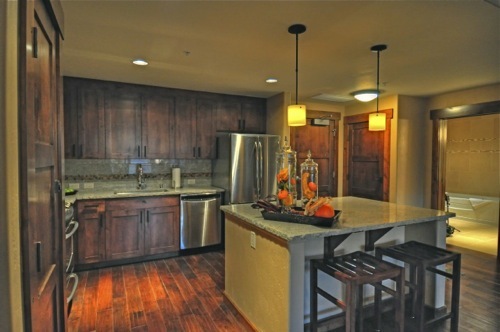 New pricing for Trailhead Lodge at Wildhorse Meadows offers an attractive deal for luxury condos in Steamboat Springs . Newly constructed, fully-furnished condos minimum bids are over 75% off of pre-construction pricing in 2007. A one bedroom + Den with spectacular views of Steamboat Ski Area minimum bid at the auction is $175,000. This is down from the original list price of $815,000 in 2007. Estimated 2012 property taxes for the same unit is $2349 and projected gross rental income information provided by Steamboat Resorts is over $29,000 per year. [*]*Auction day is Saturday, December 15, 2012 at 1pm and will last approximately 1 1/2 hours.] [*]*Home warranty plan. Seller will provide a 14 month home warranty. [*]*Bidders must provide a cashier’s check in the amount of $2,500. [*]*All sales must close on or before January 29th, 2013, (45 days after the auction). [/list] You can bid on line or I can bid for you. There is no fee to you if I represent you, so call me for the inside scoop. SkiCondos4Sale.com or call Dean Laird, Colorado Group Realty 970-846-8284.